Today, I want to give you a better way to answer the question “Tell me about yourself”. I see so many people out there giving these cold, corporate, inhuman-type answers, because they talk about just their accomplishments and their work experience, and that’s it. So, when an employer asks them, “Tell me about yourself” they just rattle off their accomplishments and some of their work experience and then stay there. Well, that’s okay. And that’s a method that I actually teach in some of my guides. But I want to give you a better way to do it, a warmer way to do it, a more personable way to do it, a more human way to do it. Because you think about it? They’re saying, “Tell me about yourself”. They’re not saying, “Tell me about all the great things that you did”. They want to know about you as a person. And so, this is like the only question that you have the opportunity to get personal with them. And when you get personal with someone, that gives you the opportunity to make a connection; a long lasting connection. And that’s what you want in the interview. You want to connect with that employer or that recruiter, that interviewer, so that they remember you, so that they see that you are a unique individual; you’re a real person and they want to know more about you. So, when they ask you, “Tell me about yourself”, instead of giving them that cold response, and really, what a lot of people are doing is they’re just answering the question, “Why are you qualified for this job?” That’s the type of answer that you’re giving when you’re telling them about just your experience and your accomplishments. So, actually tell them about you, and the way you can do that is to talk about your journey through your career; like how you got started, what sparked your interest and then what are your next steps? What did you do? How did you first explore that passion? Did you go to college? Did you work somewhere? And talk about your journey through your career up to where you’re at now, and then you end with where you see yourself going. So, let me give you an example. I mean, let’s say you’re in the medical field, and let’s say you’ve always wanted to be a doctor or a medical technician, a nurse or whatever. So, maybe a little kid, you found a kitten or a bunny and maybe it was wounded, and you nursed back to health, and you just felt this overwhelming amount of joy in your life, because you helped nurture this animal back to health. And then from that point on, maybe you were eight or 10 years old, you’re like, “I want to be a vet and I want to help animals for the rest of my life”. That’s how you start your answer off. You tell that story. Tell that story and you make a connection with them. And then you tell them what you did next. Maybe in high school, you studied more about biology and in the back of your mind, you always knew you wanted to be a vet, or maybe baby you want to be a doctor and help people. I don’t know; it could go either way. And then you talk about your journey into medical school and what you did, and where you went, and how you did it, and how you stayed excited or what kept you going, what fueled you through the process of going through that. And then talk about what you did after college, where you started working, whatever. Or maybe along the way, you volunteered at a pet hospital and you helped nurture animals back to health over there, whatever. Tell them a story about you, how you got started, and then where that led you in your life, and how it’s affected your life, and where it’s brought you up to today, and then where do you see yourself going. Now, if you’re not in the medical field, let’s say you’re in finance or banking or accounting. Let’s say in high school, you were (you know, when we’re in high school, we start to find out more about ourselves). So, maybe in high school in 10th grade, you took an accounting class. And for whatever reason, those numbers just hit you in such a way that they made sense. You started thinking about accounting numbers all the time, running things in your head, and you are really good with numbers, and you could just do simple or complex equations in your mind; whatever. Whatever inspired you to get into the field of accounting, talk about that. And then talk about what you did next. Maybe if this accounting book hit you in high school, talk about other things that you did in high school; maybe some clubs that you started or that you were in, maybe at your local church or Boy Scout club or whatever, maybe you volunteered your or your accounting expertise to help them keep their books, or maybe you ran some fund raisers in school; you know, whatever. Tell them that story. Tell them how you got started in accounting. And then moved the next phase. Talk about what you did in college. Say, “I loved accounting so much that I went to college for accounting”. Maybe you went to a Miami University or Ohio State University; wherever. Telling the school you went to, talk about what you did in school; maybe clubs that you were involved in that were related to finance. Maybe you were in a finance club, an investing club, talk about that. And then maybe talk about some internships that you had and then talk about where you went to work. And whether you’ve been working for five years or 20 years, you can still tell this story. You don’t have to be a fresh graduate to talk about what you did in college. You could be a 20-year accounting veteran and maybe you know they want to know how you got started in accounting; they say, “Tell me about yourself” “You know, back in school, I got bit by the accounting bug. And you know, I did this, and then I went to college, and then I went to work for an accounting firm and you know… And then I got my CPA”. Tell them the story, talk about your journey, connect with your interviewer. Now, let’s say you’re not in medical field, let’s say you’re not in finance. Let’s do one more. Let’s say you’re an engineer. Let’s say you’re in the engineering field, and let’s now go back to high school or even before that. Maybe you talk about how you got the bug for engineering. And maybe you were in a robotics club in high school and you started working with the robotics and connecting the electronics to the mechanical pieces and making things work and that just made cogs in your own mind turn. It got you excited about engineering; electrical engineering, mechanical engineering, whatever it is. And that’s how you got excited about it, that’s where you got started, that’s when the bug bit you. Still talk about that. And then you talk about what you did in high school; maybe talk about some other clubs, maybe you started a club, maybe you just participated, maybe you participated in competitions, robotics competitions, whatever. And then talk about where you went to school; saying, “Maybe I went to Cal Tech for engineering” or “Maybe I went to Michigan University for engineering”, wherever. Talk about what you did in college and then talk about what you did after college; internships, whatever, and give them a feel for what you did and how you have come to this point in your life. Makes sense? So, a the end of the day, the best way to answer, “Tell me about yourself” is talk about your journey. Start wherever you got excited in your life. What part of your life did the bug bite you that you got excited about whatever it is that you do? It could be engineer, it could be math, it could be science, it could be teaching. Teaching is a wonderful gift that a teacher can give to students. So, maybe you got excited early on because you had to get up and teach some people in high school about how to do something or maybe you were a tutor in high school and you tutored some kids and you just loved teaching. So, you went pursue your path of teaching. You can apply this technique, this methodology, this framework, whatever you want to call it, to anything in your career. And that’s what employers want to know. That’s what they really want to know. They want to know how you got excited and what brought you to this point in your career. Now, don’t make a book out of your answer. Ideally, your answer should be no more than a minute long; try to aim for maybe 30 to 45 seconds. And to do this, get yourself a video camera, like I have right out, and record yourself saying your answer to the camera and then go back and watch it. See how long it took you to say that answer and just watch yourself and listen to yourself. And then what that allows you to do is self-correct and you’ll be able to make adjustments to your presentation and to fine tune that answer, so that it comes off as a story. And then let someone let some family members or some friends watch it or listen to you. And what this will do is to help you polish the delivery of your answer, so that you can say to anyone and within a minute, anyone will get a feeling for what you have done. I mean, just yesterday, I worked with a client on the phone, and I just want to tell you how memorable a story is. I just worked with a client on the phone about how to answer this question, and you know what she told me? She said she’s actually in the medical field right now. She told me that when she was a little girl, she found a baby bird. And so, what she did was she fed it worm; she for that whole worms and she later realized she wasn’t supposed to do that. But what her telling me that story, she told me that yesterday; it’s still fresh in my mind, because it’s such a sweet childhood story. And from that moment on she actually wanted to be a vet. She ended up going to medical school and now she’s off into medical device sales. But still nonetheless, she stayed true to her roots of being in the medical field and that was her journey. So, she got inspired as a little kid to be a veterinarian, but ended up deciding to go into medical school and then decided, “That wasn’t quite for me”. So, she ended up in medical sales. But she told me a story and a story sticks. If you just rattle off facts and figures that are boring or that don’t have any significance behind them, they’re not memorable. And employers aren’t going to remember you when you just rattle off a whole bunch of your accomplishments. But if you tell them a story about a baby bird a baby bunny or whatever it was, whatever got you involved into where you are now, that sticks, and they remember that, and they remember you, and they’re going to remember you over everybody else. Because not everybody else is talking about fuzzy bunnies and baby birds. You see what I mean? So, go out there and your next interview, talk about your journey through your career. What got you excited? What was the passion? What was the fire in your belly that fueled you to pursue your dream? And I guarantee you; your interviewers are going to be thrilled with your answer, they’re going to be blown away, they’re going to remember you, and you might end up connecting with them on a level that no one else can or that you never thought you could. And it’s going to take you so much farther in the interview process, and it’s going to bring you closer to getting a job with them. That’s all I have for you today my friend. I wish you well on your next interview. Now, if you need with interview questions and answers. I’ve got a great guide here. This is called The Complete Interview Answer Guide. And this is this is my book. I’ve been working on this book for over 10 years now. It’s got over 140 different types of questions in it and answers to some of the most common questions you can expect to get on any interview. It’s got basic questions like, “Tell me about yourself” and “Why you want to work here?” It’s got over 40 different behavioral questions where you use the STAR method to answer those; the situation, the task, and the result. It teaches you how to answer those questions with the right framework. I can’t recommend the guide enough. And if you don’t want that that’s fine. I have a whole bunch of videos on YouTube that are also very helpful. But this book, you can get this from jobinterviewtools.com. It’s a PDF e-book. You can download it. You can get a hard copy, just like this. It’s also available in audio and video too. So if you want to get the audio version and download all of the audio tracks to your iPhone or whatever, you can do that too. 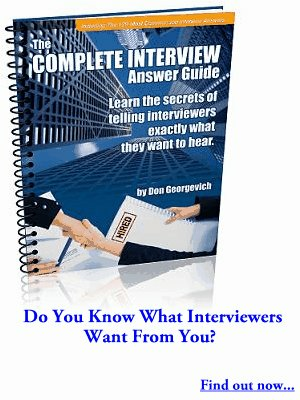 I think this is about the only interview guide on the market that is in e-book, in hard book, and in audio and video as well. That’s because it’s just been around so long that it’s developed into so many other platforms and it’s just it’s a very helpful guide.